Hello everyone! 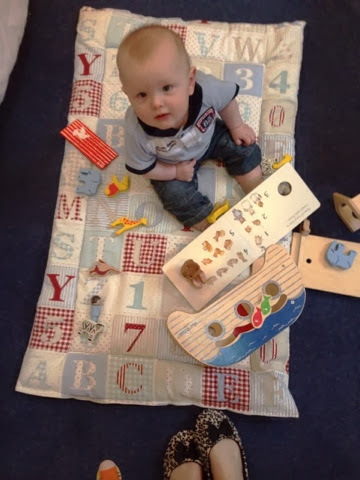 Check out Noah's new play blanket! I made this last week after picking out some fabric and wadding at our local Dunelm. Noah is at that stage where he is a confident little sitter, but occasionally he loses balance and has a topple. Although pillows are a great help, he does like to move them around to the point where they are no longer poised to take impact! So I decided to make him a nicely padded out play blanket which is really sweet and also soft enough to cushion any wobbly moments! 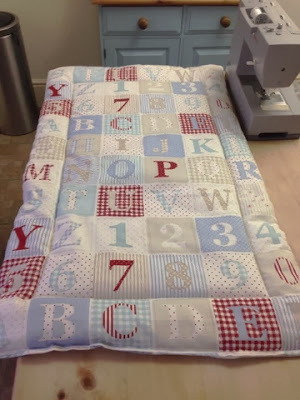 I LOVE the outcome of this, it could easily double up as a baby cot blanket too which is super handy. And here is little man playing with one of his many arks.